Even a top-of-the-line water heater won’t last forever. In fact, tankless water heaters generally only last up to 20 years while conventional heaters with storage tanks last just 8 to 10. The lifespan may be significantly shortened if the unit isn’t properly maintained. No one wants to step into an icy blast of cold water when they’re looking forward to a nice, hot shower, and if you watch out for these signs of trouble, you can avoid that unpleasant situation. Here are a few signs that it may be time to replace your water heater. If you have discolored water coming from your hot water taps, the inside of your water heater may be rusting. If so, it could start leaking and need to be replaced soon. Rusty pipes could also be to blame. To determine the source of the rust in your water, drain a few bucks of water from the heater. If the water still comes out rusty by the third bucket, your water heater is most likely to blame. As water heaters age, sediment builds up inside. Repeated heating causes the sediment to harden and can cause banging or rumbling sounds. If you’re noticing these unusual signs, it may be an indicator that your heater is nearing the end of is lifespan. Small leaks can cause moisture around your heater, even if you don’t see water coming from the tank. Because metal expands when hot, hot water tanks are more likely to leak when the system is heating up. As the metal cools, it contracts and temporarily stops small leaks. Whether your water heater is advancing in age or you’re noticing any of the telltale warning signs, you can count on the experts at G.T. 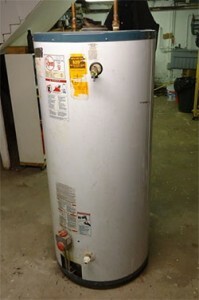 Campbell Plumbing for professional water heater repair in Rochester NY and the surrounding areas. We sell and install conventional and tankless water heaters, and we can help you choose the one that’s best suited to your home. Contact us a trusted plumber in Rochester NY today to learn more or schedule service. Call 585-548-0004.